It's RELEASE DAY!! All of the products we've been showing you this week are NOW available in the TE Store!! 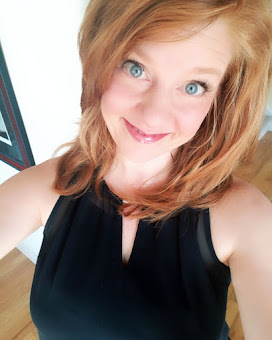 I have a few projects to share with you today just in case you need an extra push! ;) My first project uses the new Bottled Up Die. 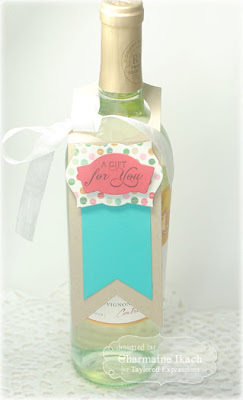 Bottled Up creates a tag for a wine bottle! It's super simple and convenient! Just die cut the tag and then decide on which sentiment and sentiment panel you want to add, and you've got yourself a hostess gift all ready to go!! I used papers from the Bundled Up Project Pantry along with some seam binding ribbon to create my bottle tag. The sentiment is from the new Wine a Little set. The next project I have for you uses a few products from the Pockets & Pages line. I started by creating the tag with the new Label Stacklets 7. The camera and sentiments on the card are from the Pockets & Pages InstaFun set. Isn't that little camera and the heart and star elements just the cutest thing ever? I just LOVE it. . .and I also love the little sentiments. "selfie", "Smile" and "oh snap". . .so cute! I used the Pockets & Pages 4x4 set to create the "hashtag" for selfie, and used the "location pointer" as the tag loop. The arrow is from the Pockets & Pages 3x4 set. As you can see, you can use the Pockets & Pages line for things other than scrapbook pages! 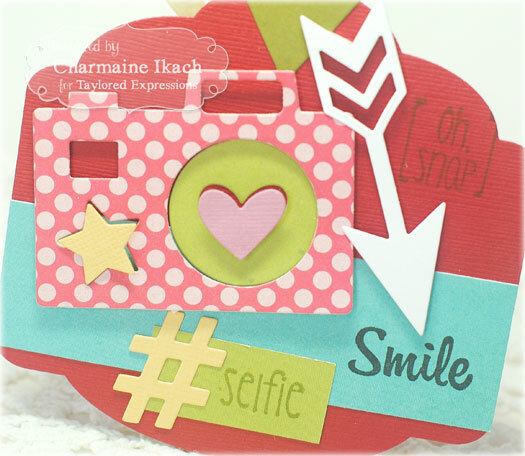 My last project for today uses a few Pockets & Pages products for an actual scrapbook layout. The papers I used are from the 'Tis the Season Project Pantry. I create the title using the Pockets & Pages 3x4 set, the Pockets & Pages 4x6 set, the Bars of the Year set, the Sweet & Simple #s and Label Stacklets 7. The picture page uses the Sweet & Simple Alpha Upper to spell out "Joy". 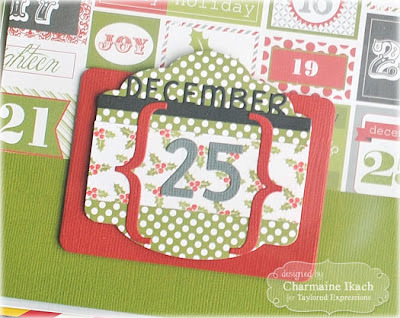 I LOVE how quickly pages come together with the Pockets & Pages line of products! If you notice, the pockets sleeves are different than I used the other day. The other day, the sleeve had four sections on each side. Today, the sleeves are full 6x8 sleeves. All of the different pocket sleeve layouts are available in the 6x8 Variety Pack. I hope you've enjoyed all of the projects this week! Thank you for stopping by! 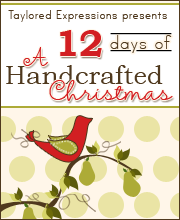 Be sure to see what the rest of the Baker's Dozen has created for today! HAPPY SHOPPING!! Wow! 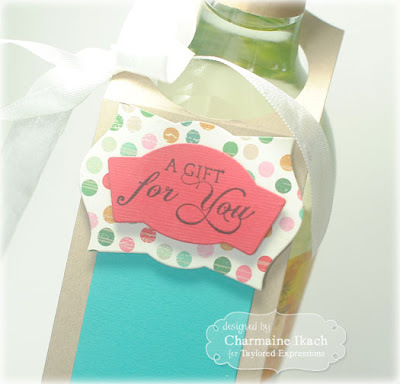 Your wine tag makes the perfect hostess gift, Charmaine! 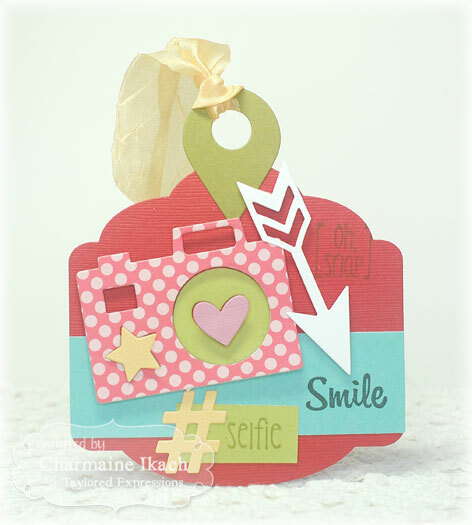 LOVE your sweet selfie tag! The mix of dies is incredible! And your layout is fabulous! The photo is just the sweetest!